with a Steel Bullbar & Heavy Duty Towbar! available today from Midland Towbars! Rugged Steel Bullbar to suit MQ Triton! If you’re talking serious protection, we’ve got what you need. 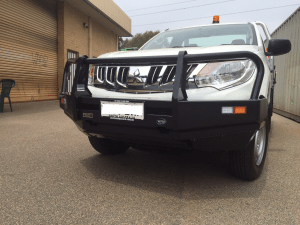 Strong & Stylish Bullbars to suit your brand new Mitsubishi Triton MQ. Best looking and most rugged engineered bullbars available on the market. Designed & Tested in Australia to meet our stringent Australian Standards. We have a standard steel bullbar and a winch bullbar with foglights – both air-bag approved! 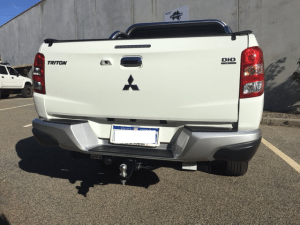 MQ Triton Heavy Duty Towbar. Get ready to put your new rig to work with one of our Heavy Duty Towbars made specially for your New MQ Triton. Our towbar fits nice and snug under the step as you can see – practical and aesthetically appealing! And with a tow rating of 3100kgs, you’ll be able to take all the gear you need with you! As we head into the last month of the financial year and everyone is looking for those EOFYS, come and talk to us about one of our package deals! Lets work out a deal with a bullbar, towbar, tinting combination. Or perhaps a bullbar, towbar & set of spotlights would be more attractive to you? 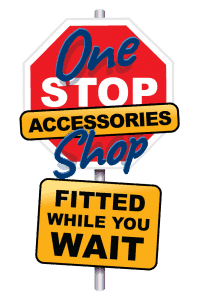 Remember, we can also supply and fit Canopies, Electric Brake Controllers and much, much more! Don’t have an MQ Triton? No problem. We also have steel bullbars and heavy duty towbars to suit the new Hilux, Ranger, BT50 and NP300 Navara. You can save a bundle of $$$$ when you shop with Midland Towbars.